Test automation is the process of using special software for various software testing processes. In a bid to progress in the global test automation market, leading players are trying to integrate several automation testing offerings under one umbrella. They are also expending time and money on bettering their current test automation offering to bolster their positions further. There are a number of factors stoking growth in the global test automation market. Most prominent among them is the surging digital transformation that has led to the swift uptake of software testing and quality assurance (QA) across the enterprises. Apart from that, the proliferating mobile applications in the domain of communications, productivity, and multimedia travel, and the different cloud applications being increasingly deployed to bring down the effective time-to-market are also helping to catalyze growth in the market. Posing a roadblock to the global test automation market is the lengthy timeframes, steep investments required for setting up appropriate test labs, and high operational costs. As per a report by Transparency Market Research, the global test automation market will likely expand at a robust CAGR of 15.4% from 2017 to 2025 to become worth US$ 109.69 bn by 2025 from US$ 30.45 bn in 2016. The global test automation market can be bifurcated into products and services, based on the type of components. Of the two, the services segment accounts for a majority of share in the market and going forward too is expected to retain its leading share by clocking maximum growth on the back of most organizations preferring managed services. The services segment can be further divided into advisory and assessment services and managed services. Similarly, the segment of products can be further broadly divided into test automation tools and type. The test automation tools can be segregated again into configuration testing, functional testing, web services testing, compatibility testing, security testing, acceptance testing, integration testing, load testing, mobile testing, migration testing, platform testing, usability testing, network testing, and QA process design. Of them, the segment of functional testing generated most of the revenue in the global test automation market in 2016. This is because of the surging popularity of agile development practices to bring about a high degree of automation in the functional testing process. From a geographical standpoint, North America grosses maximum revenue in the global test automation market. In 2016, it contributed about 46.0% share in the revenue in the overall market. In the years ahead too, North America is slated to hold on to its leading share owing to the increasing traction of QA within organizations, as more transformational projects are implemented to bring down the time-to-market and augment returns on investment (ROI). Europe trails North America in the global test automation market on account of the rising sophistication and maturity of the testing/QA sector. In terms of growth rate, however, Asia Pacific is expected to surpass all other regions by clocking a strong 16.5% CAGR between 2017 and 2025. The growth in the region will mainly be brought about increasing investments in internal professional testing resources, existing tools, and external outsourced resources. Some of the prominent players operating in the global test automation market are IBM Corporation, Wipro Ltd., Capgemini S.A., Cognizant Technology Solutions Corp, Infosys Ltd, Hewlett-Packard Company, Tata Consultancy Services, Hexaware Technologies, Wipro Ltd., Zensar Technologies, Qasymphony, Inc., SmartBear Inc., and Tricentis GmbH. 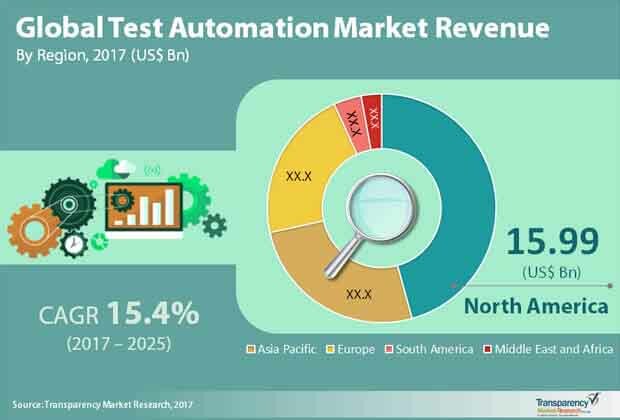 The “Test Automation Market” report provides analysis of the global test automation market for the period 2015–2025, wherein the years from 2017 to 2025 is the forecast period and 2016 is considered as the base year. The report precisely covers all the major trends and technologies playing a major role in the test automation market’s growth over the forecast period. It also highlights the drivers, restraints, and opportunities expected to influence the market growth during this period. The study provides a holistic perspective on the market’s growth in terms of revenue (in US$ Bn), across different geographies, which includes Asia Pacific (APAC), South America, North America, Europe, and Middle East & Africa (MEA). An in-depth analysis of various geographical regions is going to provide a precise and detailed understanding of the global test automation market over the forecast period.